This is a little side-project I have been working on due to several requests. 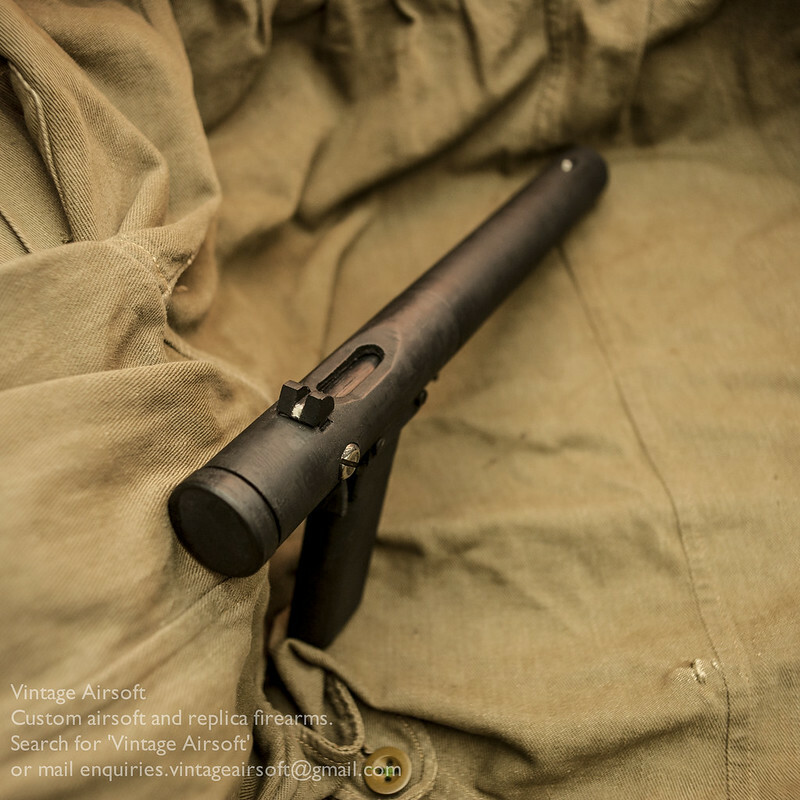 This replica Welrod is almost entirely 3D printed. I’ll be offering it in kit and complete form. The trigger and grip safety are both sprung. The bolt opens and locks like the original. It has a detachable magazine. 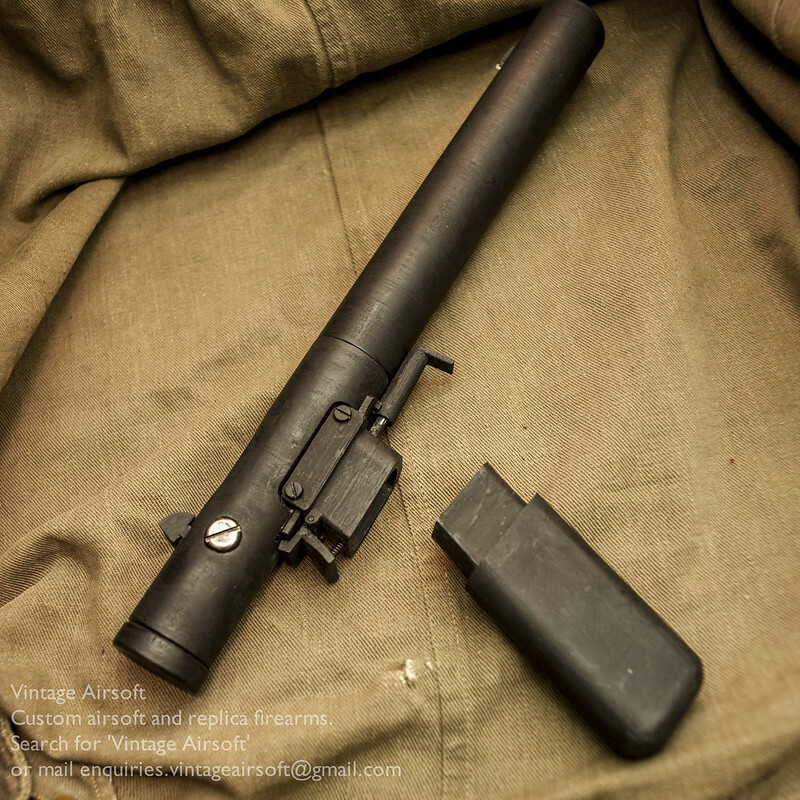 And the shroud can be removed to access the suppressor and barrel. The suppressor internals, showing the spacers, rubber wipes and washers. 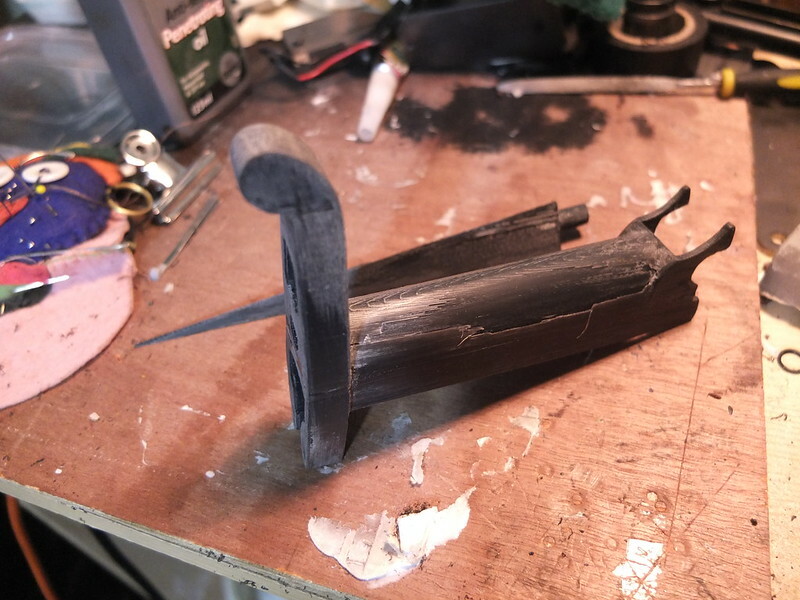 And the rebated muzzle, which allowed the gasses to expand a bit for a slightly tidier kill when used pushed up against the body of an unsuspecting target. 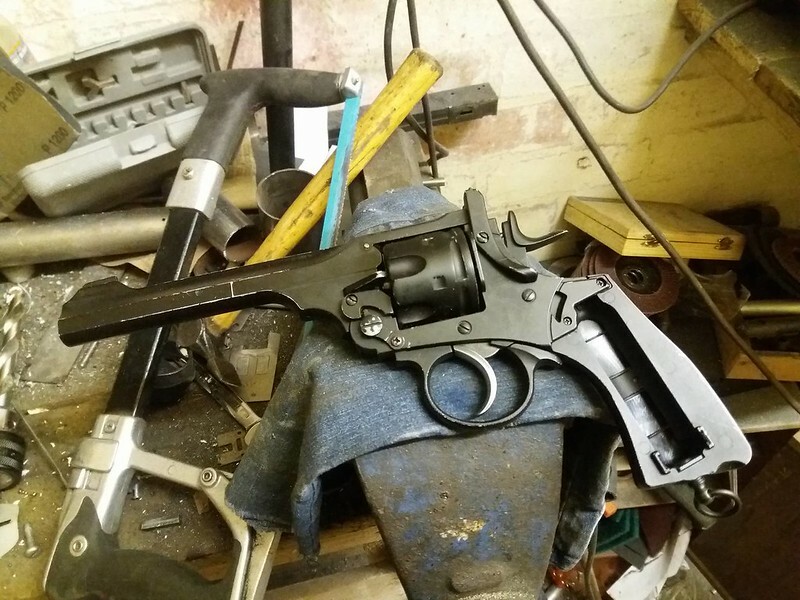 I thought it was about time that I took a look at the new Well Webley. Having owned a Wingun for some time and having seen the incredibly low price point of the Well I had to see what it was like. Side by side, these two guns look very similar in shape. It’s clear that the Well is a plain clone of the Wingun, differing in a few small details, other than the obvious differing finish. Although the Wingun is available in a black finish, I’ve never had one to compare to this. The Well finish is thick, when you first get it it needs breaking in a bit to make the action smooth both in the hammer, trigger and break-action. The Well lacks the detail of trademarks, but in use these are not things you will realistically notice. It does however have some seamlines which would need filing off for the optimal aesthetics. Weight-wise they are very similar, with similar heft and balance. On the scales, there is only 10g between them. It is quite clear that the Well is a direct clone on the basis of this. Aside from the finish and trades, the only clear identifier of the Well is the screw that controls the cylinder lock. This is a Phillips head rather than a flat head. I have no idea why they chose to do this as they use flat head screws elsewhere. 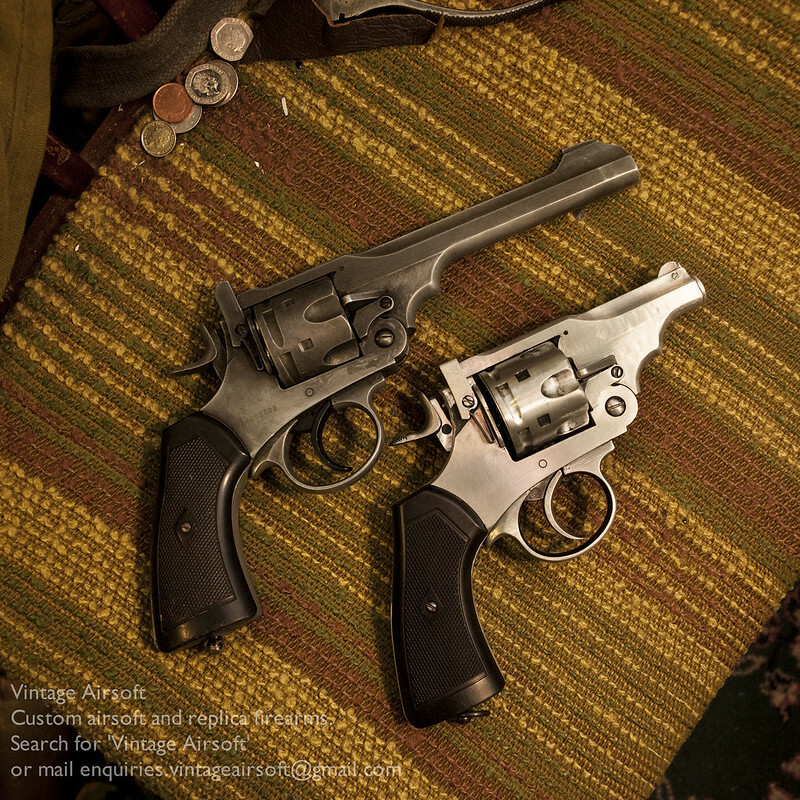 The shells appear to be interchangeable (however see below for more detail on this), I can drop Wingun and Well shells into each revolver with both cycling absolutely fine. The Wingun shells are better fitted and finished, with the heads of the Well shells being a little more rough and a little softer. 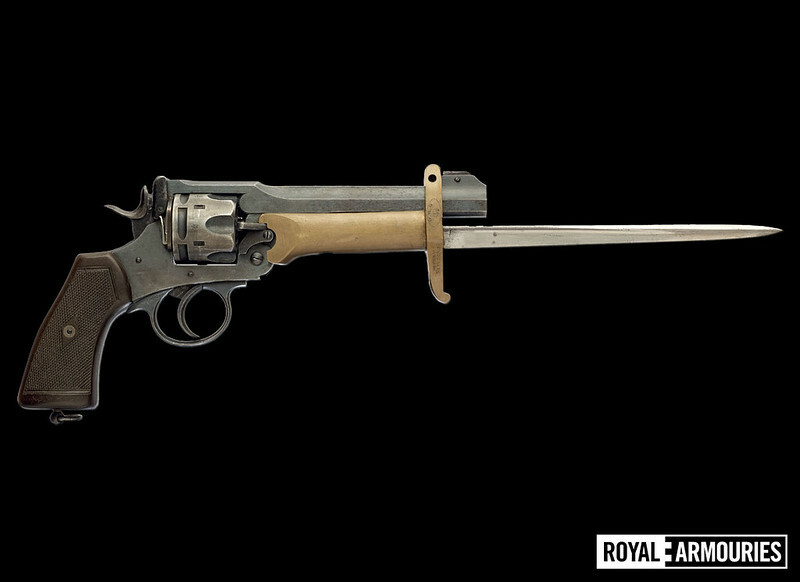 The Wingun shells also have ‘Webley .455’ written on the back, which may seem to make them more authentic at first glance, this is disregarding the diameter of the shells being .38. In terms of feel, both are pretty much identical. 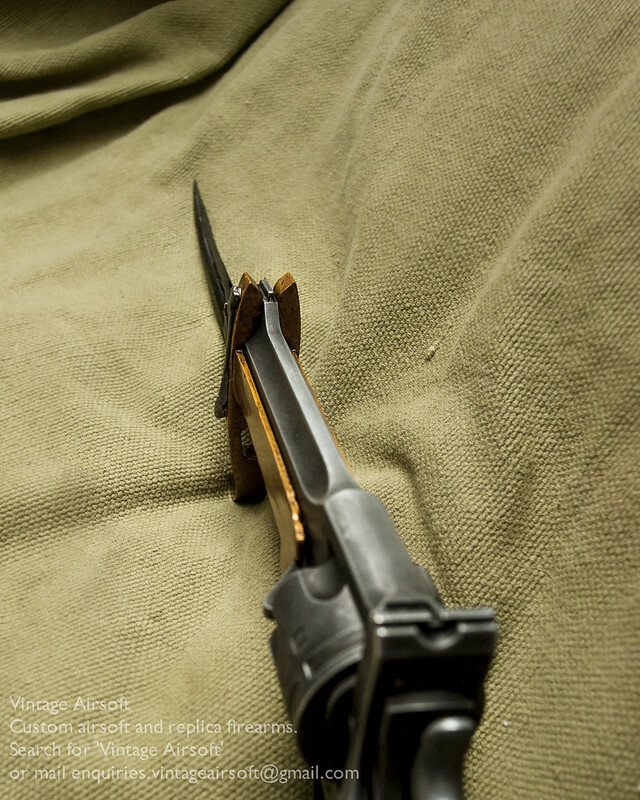 The Wingun is perhaps a little smoother, but to be fair it has seen heavy use ever since I bought it, meaning any rough edges have long since worn off. The break action is slightly easier on the Wingun, which isn’t necessarily a good thing. 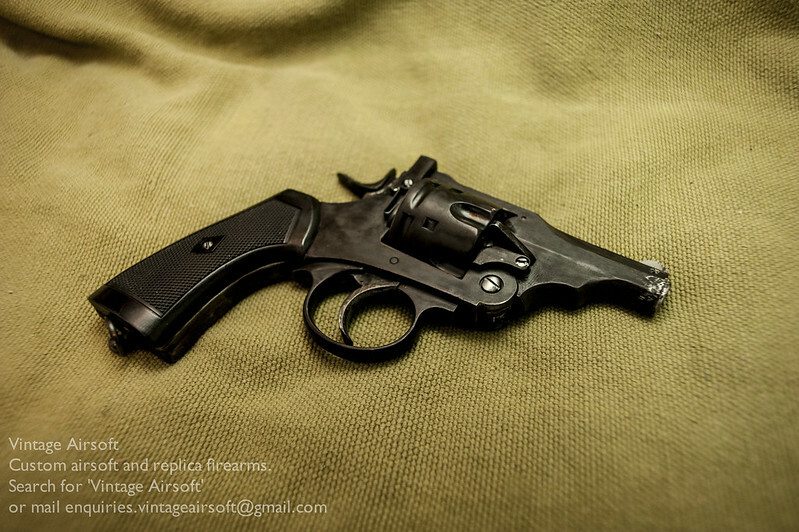 I have had this revolver open on me in the field: resulting in either spilt shells or a delay while I close it in order to fire. The Well appears to have a little nodule on the action lock which gives a slightly more positive lock-up. The Well, on first opening the revolver, had a very loose fitting cylinder. The cylinder lock does not work like the original (which is very well replicated on the Wingun), but appears to be entirely reliant on the two screws that hold the locking piece itself. These were initially far too loose, meaning that the locking piece did not grip the cylinder. On tightening, the cylinder no longer fell out, however it became unreliable to cycle in double action. Loosening the cylinder lock slightly allowed the cylinder to remain locked in place and cycle fairly reliably. The auto eject works well on both guns. The Well is perhaps a little heavier, but again this could be due to wear on the older Wingun. 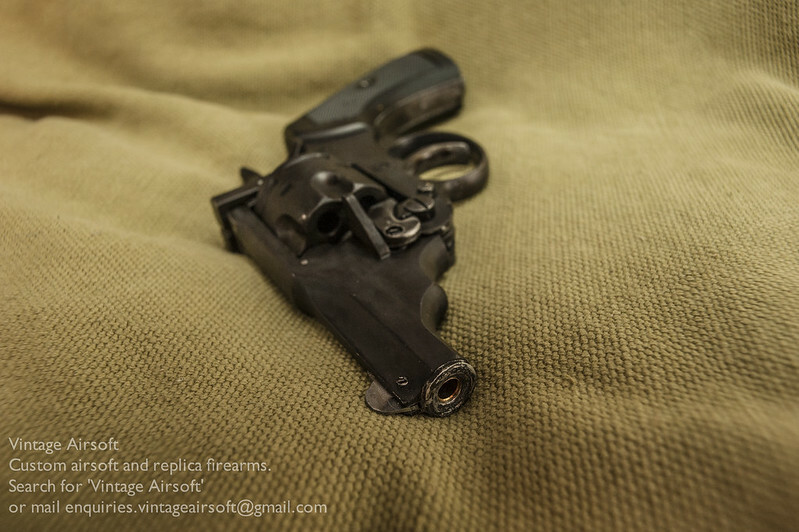 The barrels, on all airsoft revolvers I have experience of, move forwards and backwards with an attachment that interfaces with the cylinder to provide a seal and reduce gas loss. On the Wingun, this is aluminium. On the Well it is some kind of rubber. 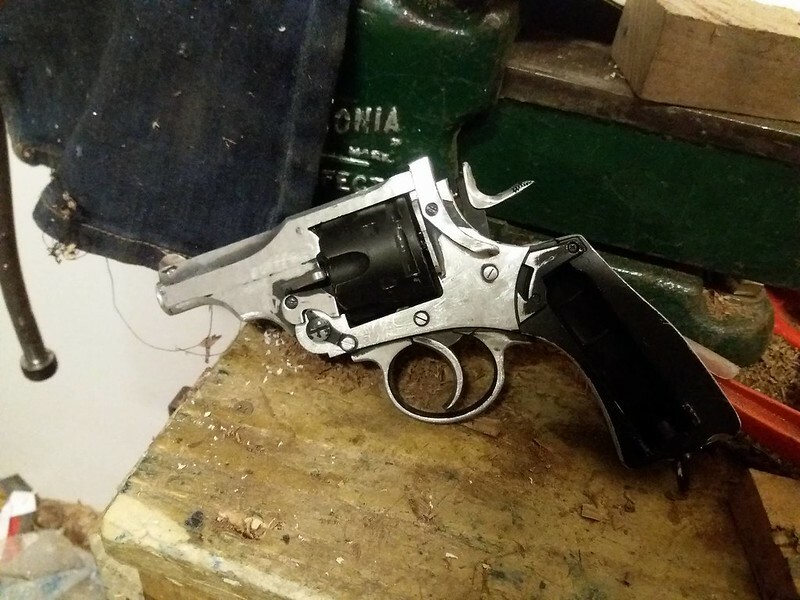 I’m yet to see if it actually makes any difference in wear over time but it does seem to make single action use slightly heavier for the Well. Not so much that you would notice in anything other than a precision shooting environment, which these replicas are really not designed for. On the note of precision, the Well has a feature the Wingun is seriously lacking. The Well comes with a fixed hop pre-installed in the barrel. Although it is not a majorly difficult feat to install a fixed hop using either the o-ring method or a flat hop, it is nice to be saved a job, especially given it would not have been a difficult thing for the original manufacturers to do. Chronoing and accuracy testing will be with .25g BBs. The Wingun is not in stock configuration, it has had an o-ring hop added. The temperature outside hovered around 1 degree Centigrade. It was probably colder in the workshop. The results were… interesting and somewhat unexpected. To the point where I will probably retest at a later date. It was VERY cold in the workshop which will account for some of the results but not the inconsistency. After firing off a couple of batches of shells it felt like the Well was low on power, so I put it aside to run the same tests on the Wingun. When I finished two Wingun tests, I picked the Well up to continue testing and it was back up to strength. Interestingly it seems like the Well suffered from cooldown much more than the Wingun, which considering their build is near-identical is surprising. Accuracy tested at 5m, obviously you will generally be further than this. I may come back and do further testing on this at a later date. On these Huns head targets, the bull is 30mm, the second ring is 70mm. In this test, the Wingun produced a significantly smaller group. In fact the first Well group was largely not on the paper. Further testing is definitely required. The extractor of the Wingun is a a bit more positive. The Well sometimes fits the shells and sometimes does not. It seems random as to when it does or does not, I presume this is due to cylinder movement as described in the first part of this review. It is hard to see the spacing issue with the VA shells due to their being white, in the picture below you can see that the rims sit proud of the cylinder. It’s no more than a millimetre but it prevents rotation and even lockup. Also, when loading the CO2, the Well grip panel did not click back into place easily. I had to bend the spring clip a few times to try and get the correct angle for it to fit into the lock and hold the grip in place properly. Another issue I had with the Well was that it did not always cycle reliably, the hand would push the cylinder but not push it all the way around somehow. The extractor snapped. Hence having to come back later. In summary… if these revolver were the same price, from my experience of these two samples, I would say the Wingun edges it. It is more consistently reliable and hasn’t broken in my extensive use of it whereas the Well example I have broke in the testing phase. The Well does have a more positive lockup, which is nice. Also the ready-fitted hop is a good thing, though when firing the shot shells it appeared to have very similarly tight groupings to the Wingun with its o-ring hop. So the difficult bit is that they are not the same price point. The Well is, at the time of writing, 1/3rd of the price of the Wingun (on a good day). It is hard to say that you should spend so much more even when out of the box reliability is such an issue. I am sure that the Well could be made reliable, but it will require time and effort. 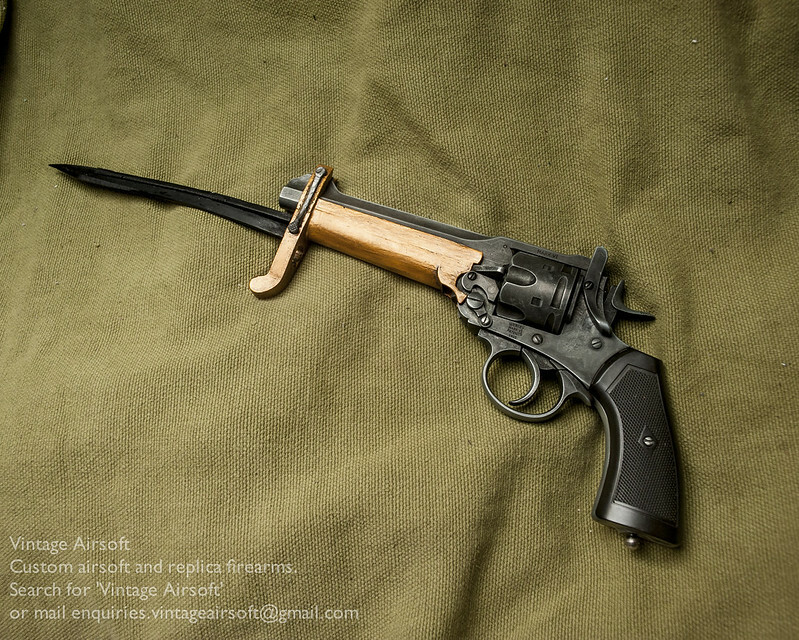 The Wingun is a pick up and play gun with minimal maintenance required to keep it going. If this content interests you, subscribe to the blog or join us on Facebook. 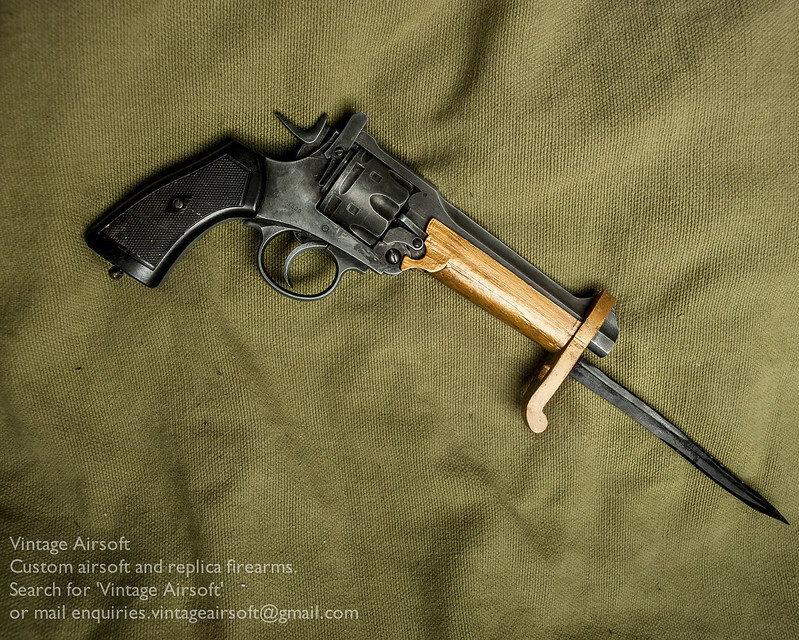 Don’t forget you can buy some of our ready-made products on Etsy, including our own Webley shells. Revolvers, giving you hop. 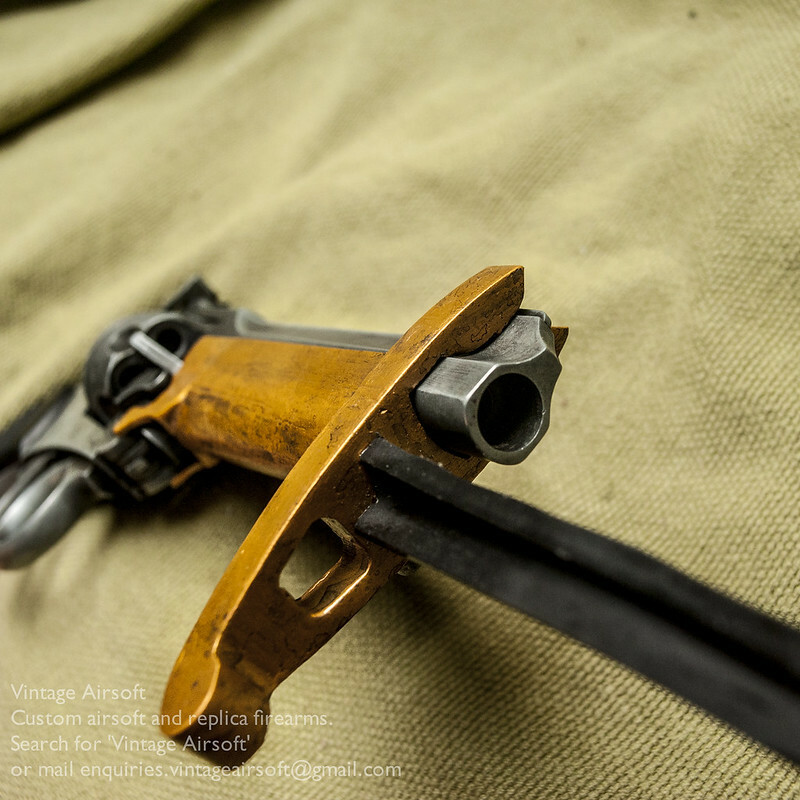 Colt Single Action Army stripping. 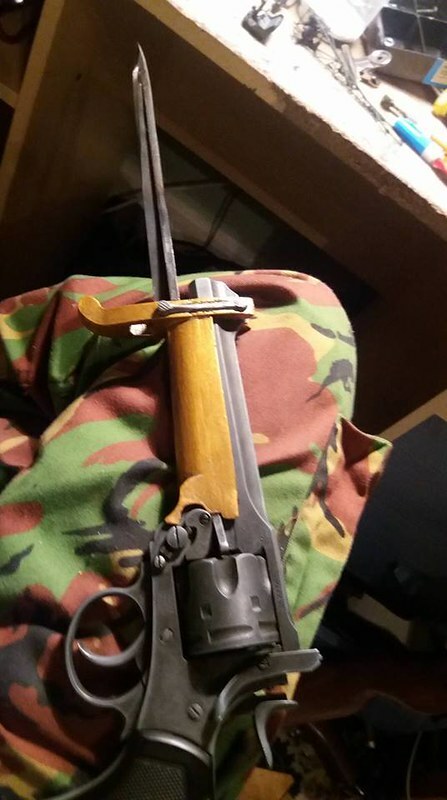 Our willing volunteer to have a hop added is this gorgeous blued Colt Single Action Army. First step, remove the side plate. Then take out the spring and the hand (the part which pushes the cylinder round). You can then pull out the centre pin and the drum. There is a pin at the top of the barrel in the frame, push this out with a punch and a second pin that holds the ejector unit in place. With both of these removed you can take the barrel off. You can then slide the inner barrel out. At this point get out the o-ring and round needle file. The o-ring should be 1-2mm thick. 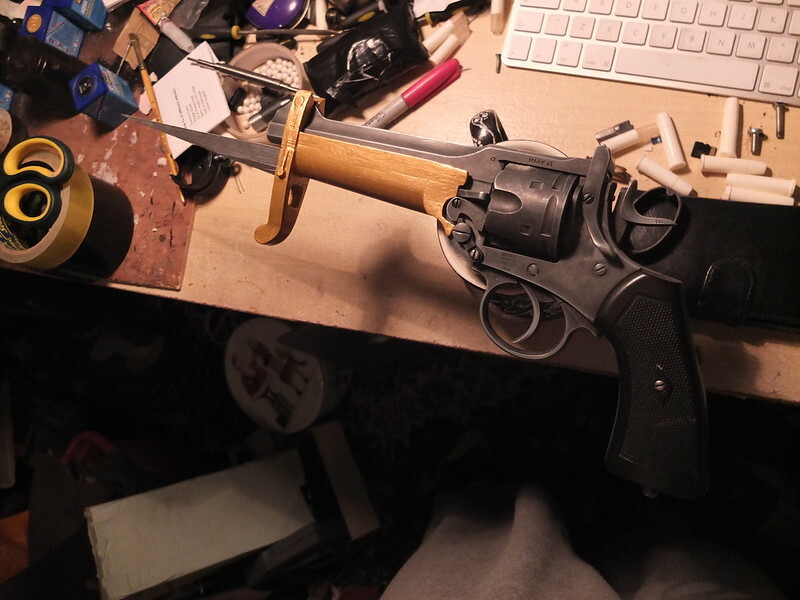 Then, start working on the barrel. Keep the channel the file produces on one side, by the time you work through to the inside you want about 3-4mm of the circumference removed from the inside. You may wish to give yourself a little extra space on the outside to hold the o-ring. Use a very sharp knife to cut the rubber roughly to size. Once in situ, use the knife again to chamfer the edges of the o-ring so that it sits fairly flat against the barrel. There should be minimal space between the rubber and the barrel to preserve the gas seal. Through the barrel you should see just a flat, small line of rubber across the top. It doesn’t need to be much, just enough to catch the BB as it passes. 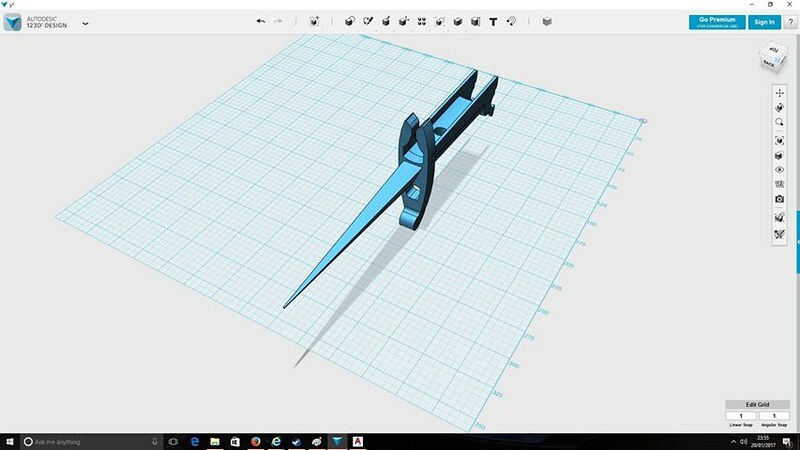 If you can’t see it, file away a little more but go slowly, you can’t add material back on. Use the collar at the back of the barrel to hold the o-ring in place. Check inside the barrel to make sure the o-ring hasn’t slipped in. 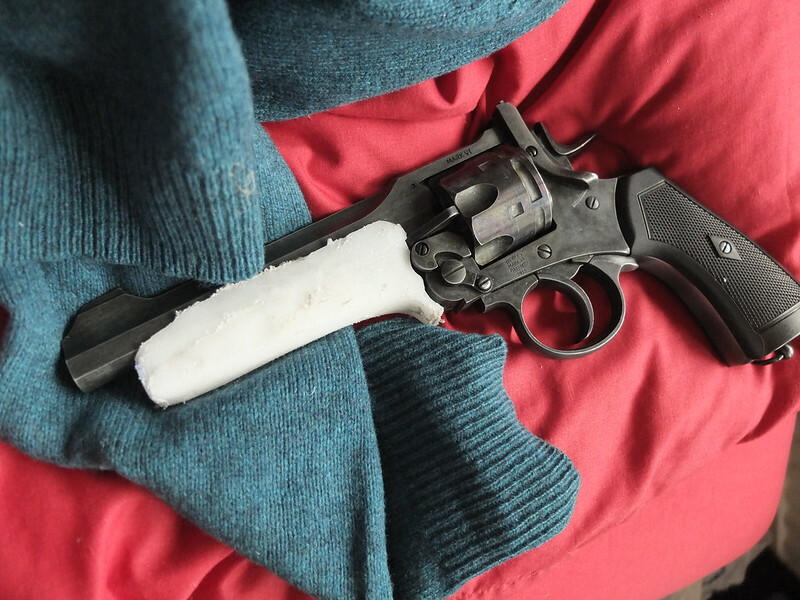 It should be firmly wedged in place by the collar, depending on the pistol you may wish to seal it with electrical tape or PTFE. 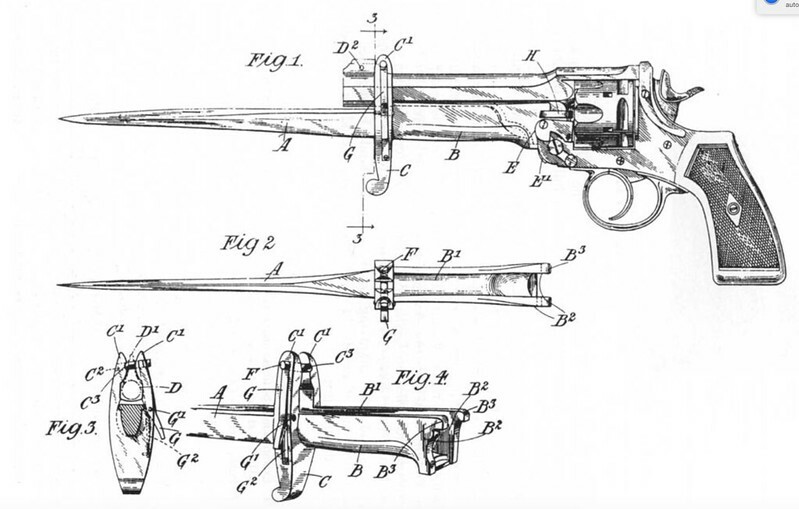 Some pistols have a locating lug on this collar, which keeps the barrel oriented in a specific way. This gun does not, but if yours does then make sure the hop window is oriented correctly to the top. Put it back in place, make sure the hop window is at the top. Re-assemble the gun, there aren’t really any specific tips to put the SAA back together. While you have it open however, oil the moving parts with a little light oil (3-in-1 is perfect) and if you haven’t a CO2 cartridge in, put silicone oil into the cartridge pin and on the seal. 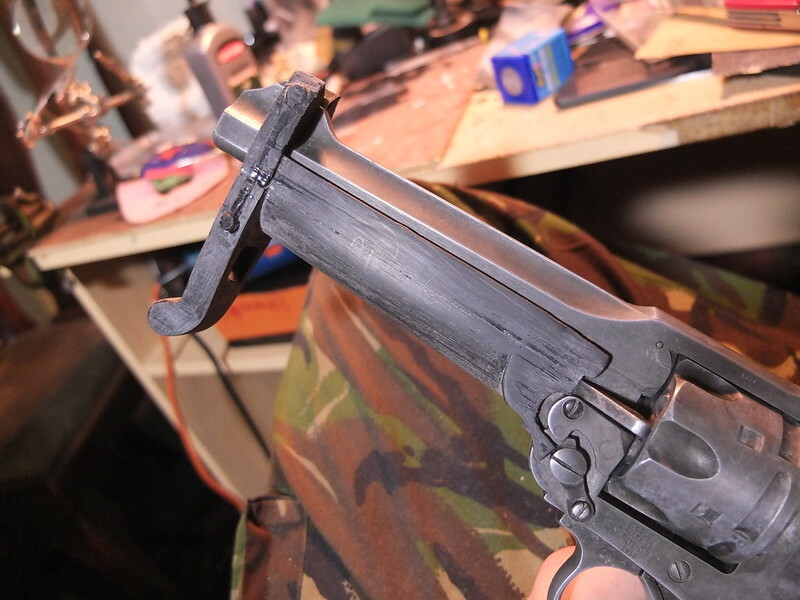 Revolvers don’t need a lot of maintenance, but a bit of oil every now and then keeps them going nicely. If you are so inclined, you could use a flat file and install a flat hop instead, though this fixed hop is quite adequate. If you found this article of interest, consider subscribing to the blog, or join us on Facebook. Don’t forget you can buy some of our ready-made products on Etsy. 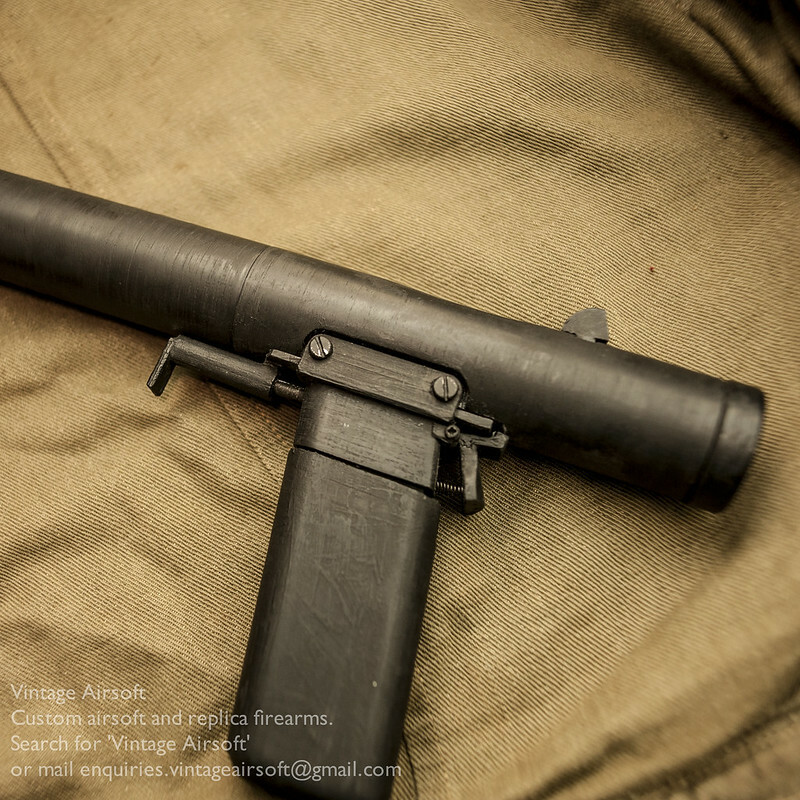 Our long-term readers may remember a long time ago an introduction to the Welrod. 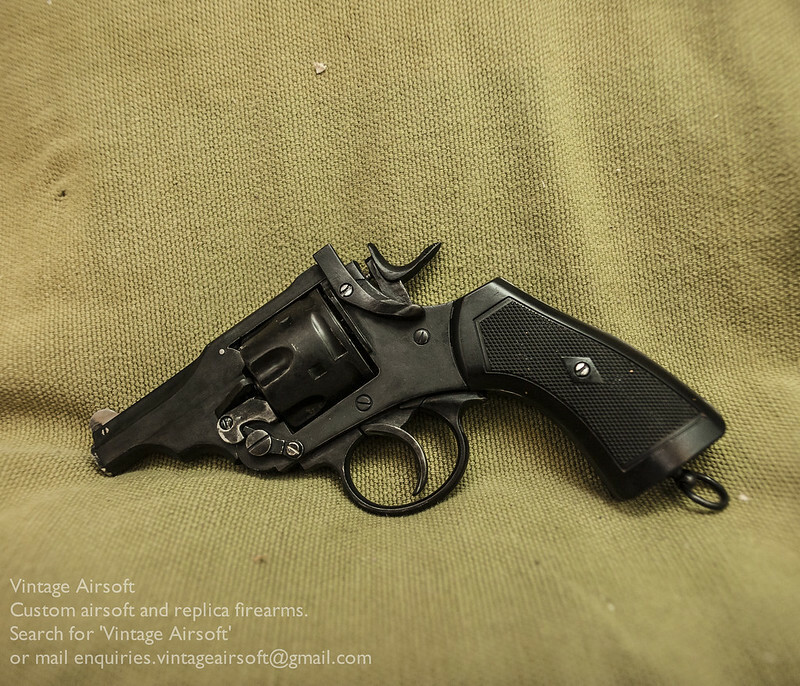 While the initial project was for an airsoft model, it ended up being an inert replica for the client in question. 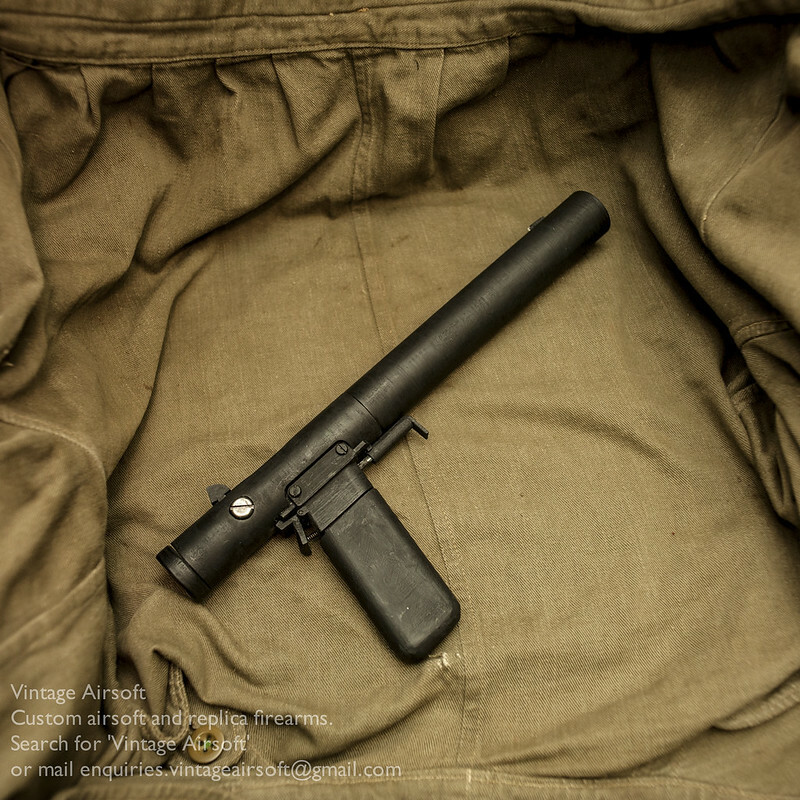 Well, the Welrod is back for another attempt at the quietest airsoft pistol around! 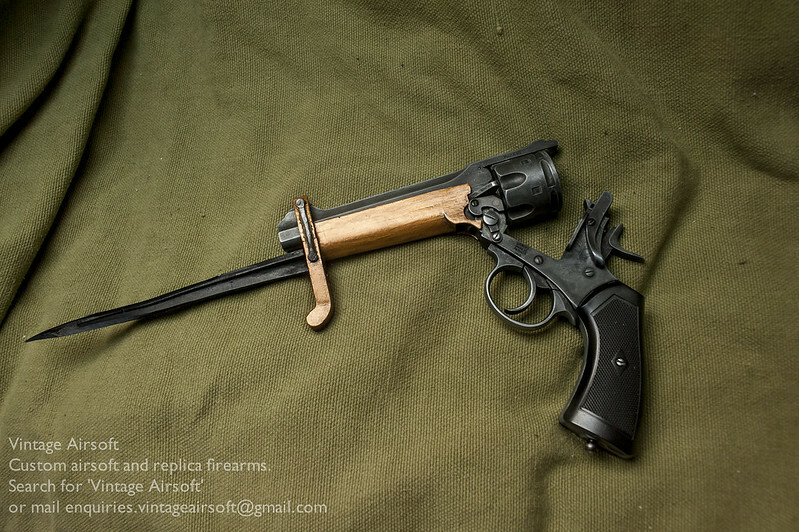 The base gun for this is a double-action non blow back CO2 pistol. For those of you who like the internals of guns here is a picture! In order to keep things simple (K.I.S.S. or Keep It Simple, Stupid is my motto), I’m keeping as much of the frame as possible as it does a good job of holding the internals and designing a new frame… well suffice to say that life is short. The red coloured areas will be removed over the course of the build. The donor with several of the red panels cut away on one side. I actually quite like the slightly steampunk aesthetic of being able to see some of the internals. The receiver in progress, the first step is to cut out a recess for the donor. Which, with both halves now matching, fits in very nicely. 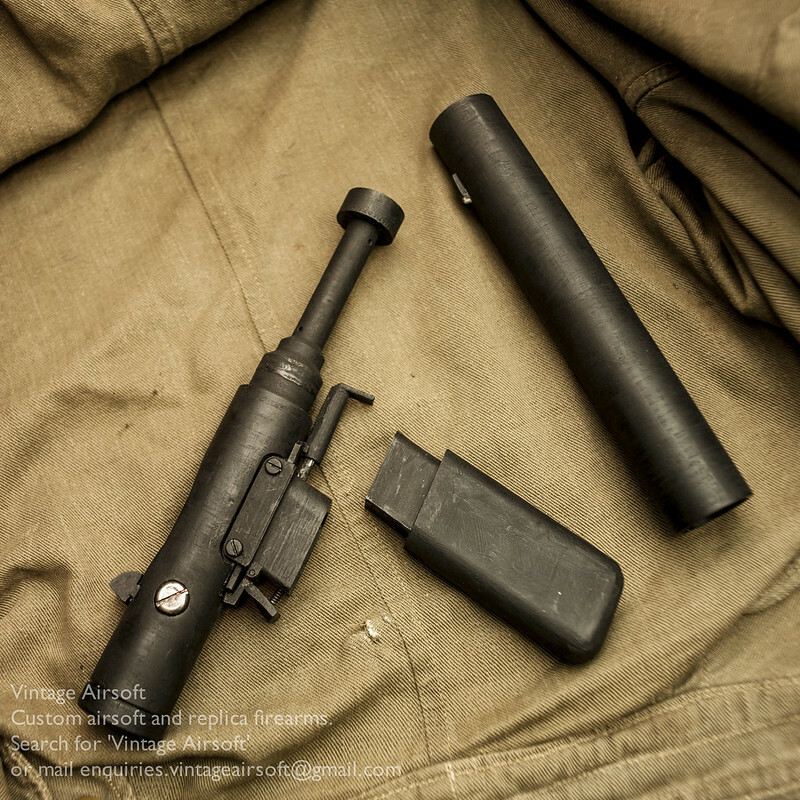 Inside the tube is a buffer that holds the front of the barrel and stops the mainspring. In theory this could be adjustable to make the barrel unit strike the valve harder/softer to control FPS. I’m not sure at this stage how feasible this would be though. The front cap and back cap, freshly turned on the lathe! Both parts are in mild steel so will match the rest of the receiver nicely when all finished. 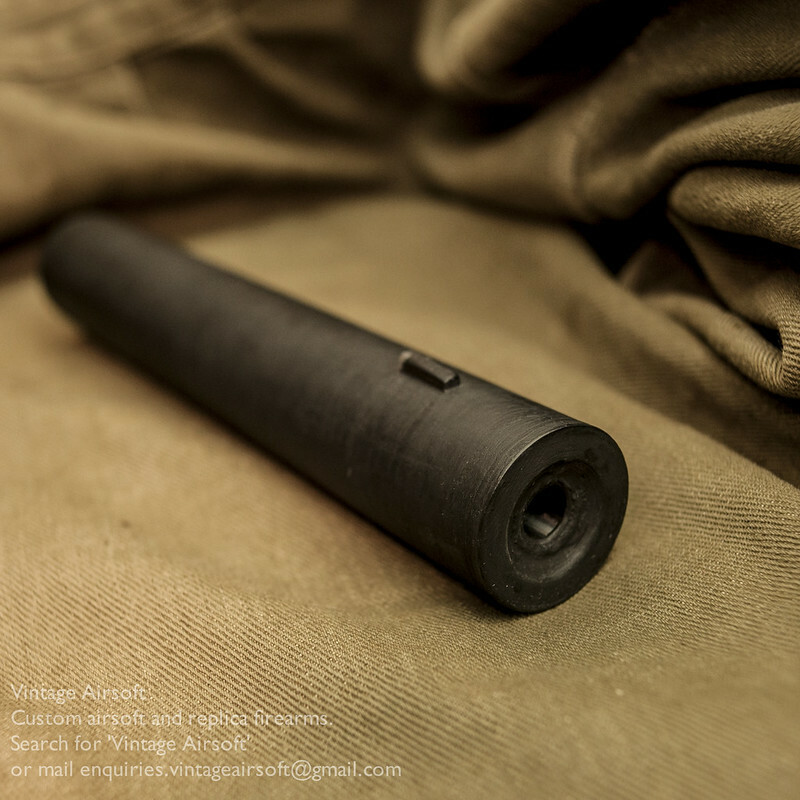 The dip around the muzzle is to disperse the muzzle blast more effectively when used at point-blank range. Which it often had to be as accuracy was pretty appalling with the original! A close-up of the back end. 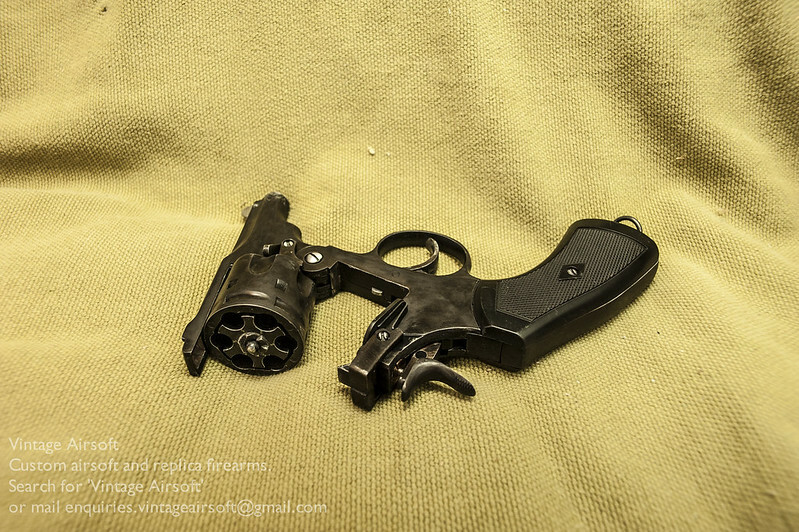 The next stage is to make the trigger guard and housing unit, then modify the pistol grip. 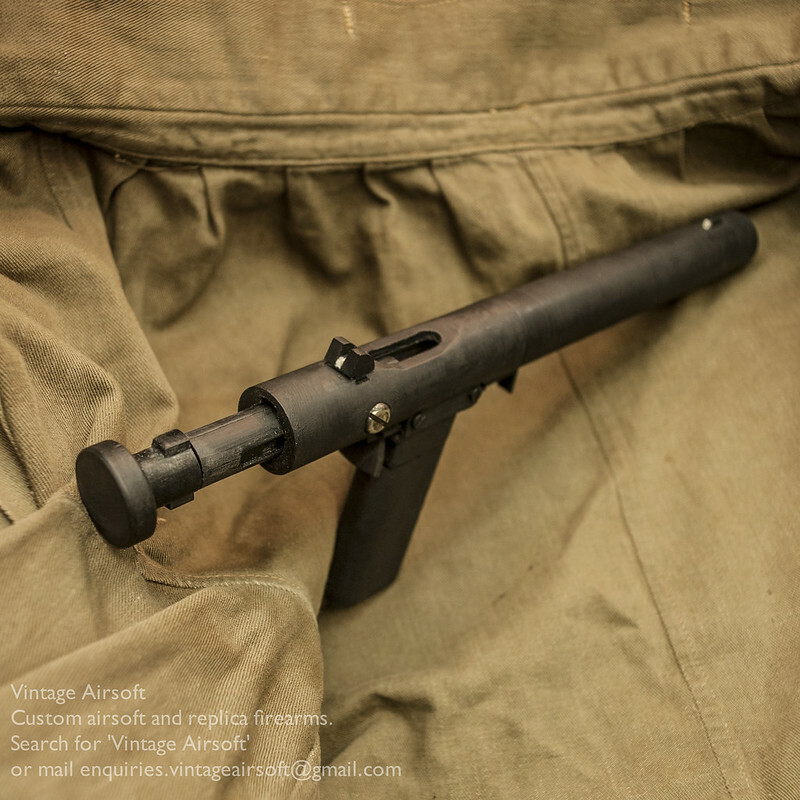 If you would like to discuss commissioning a gun of your own or want to see more content like this,feel free to drop us an email at: enquiries.vintageairsoft@gmail.com to discuss or join us on Facebook! Some pictures of the completed build! 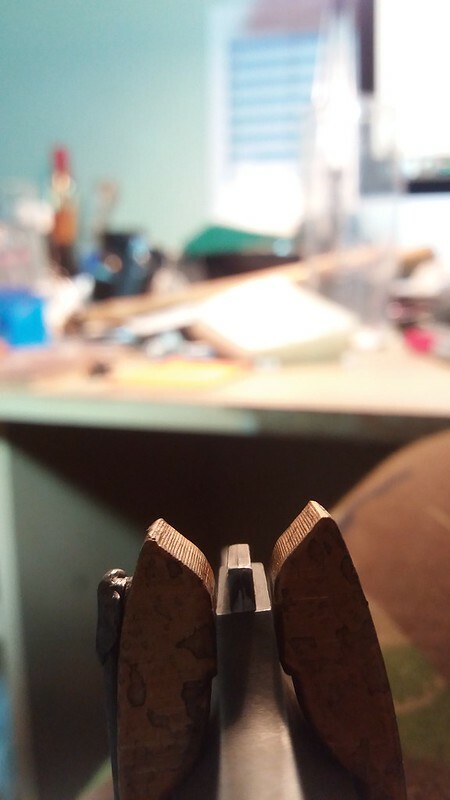 It’s not 100%, I think I will re-visit the rear sight at some point in the future and improve on the shape a little. 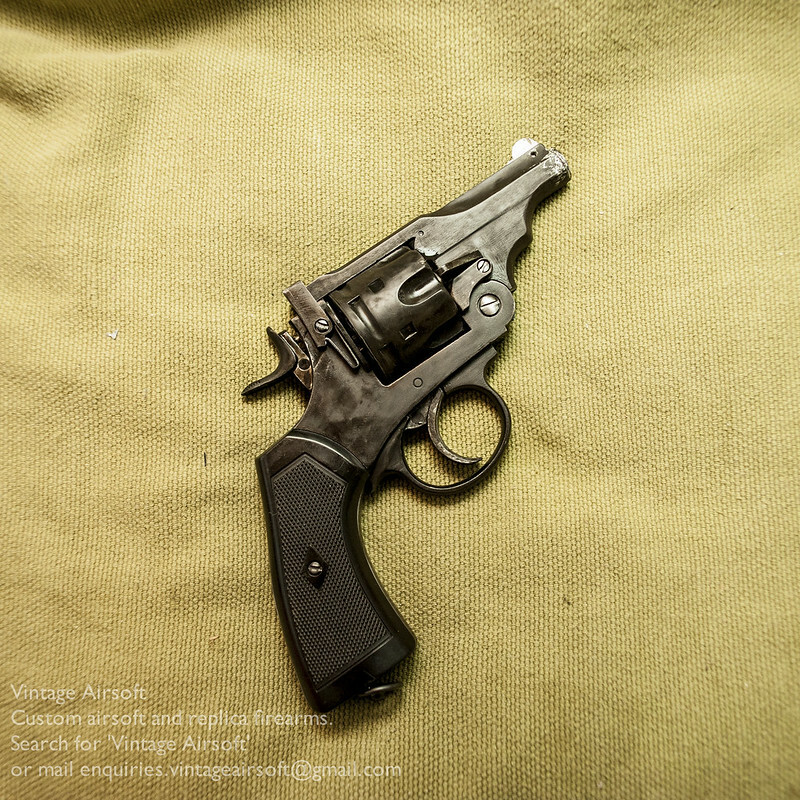 With the exception of the areas left in the white, there is a thin coat of paint over the whole pistol in a dark blue, to try and simulate the blued effect of the original. 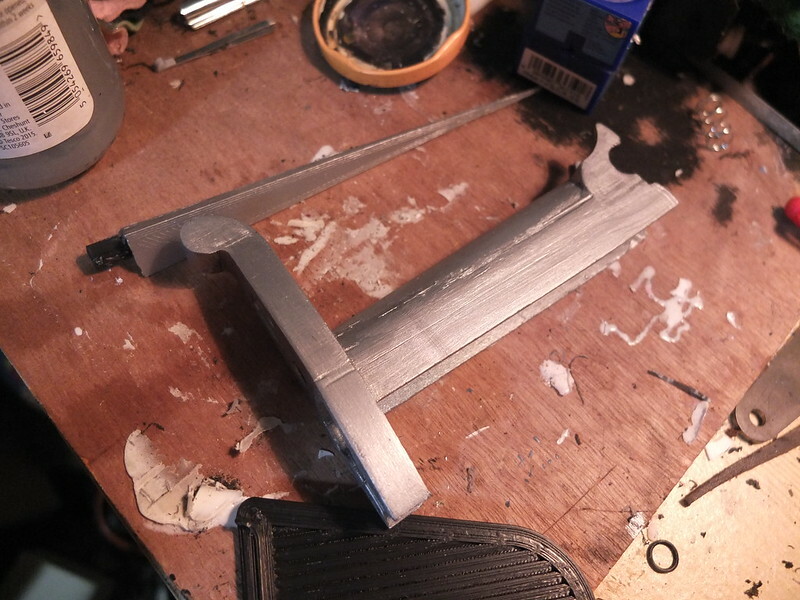 It is quite successful, though the dream is to have an all steel model that is correctly blued! The text is slightly highlighted with off-white paint to improve visibility as well as authenticity. The original magazine plugs of the era were wooden, sadly this can’t be achieved with this model but I have painted them to give some of the effect for now until I can find a solution. And the DWM mark on the toggle lock. I need to find a way to fill this more effectively with paint, for some reason the usual technique isn’t working so well but the etching itself was satisfying! 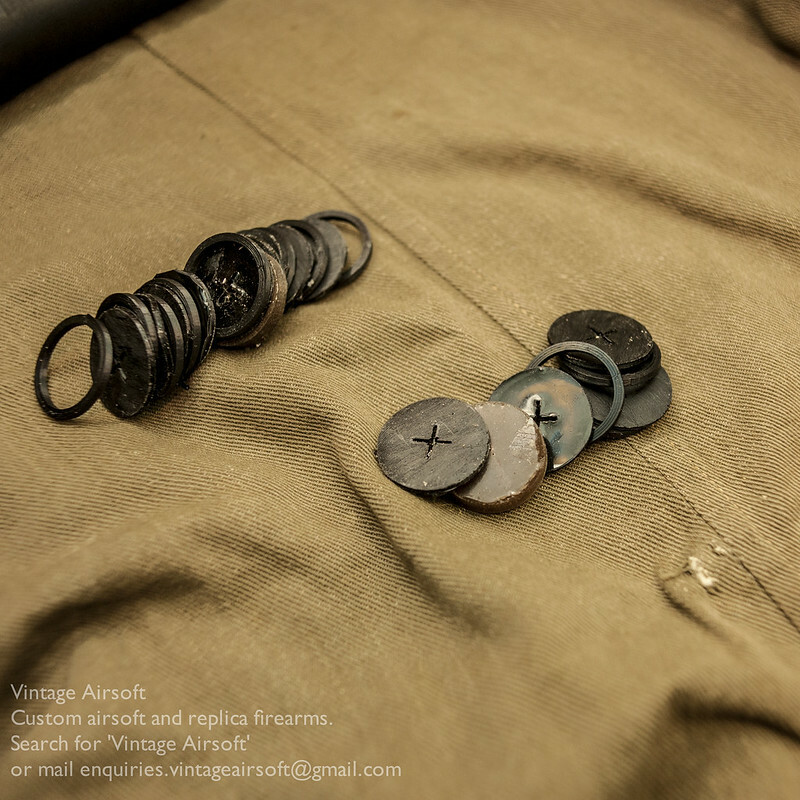 If this post has inspired you to want a gun of your own, drop us an email at: enquiries.vintageairsoft@gmail.com to discuss or join us on Facebook! To see the whole of this build from the start, you can see it here. 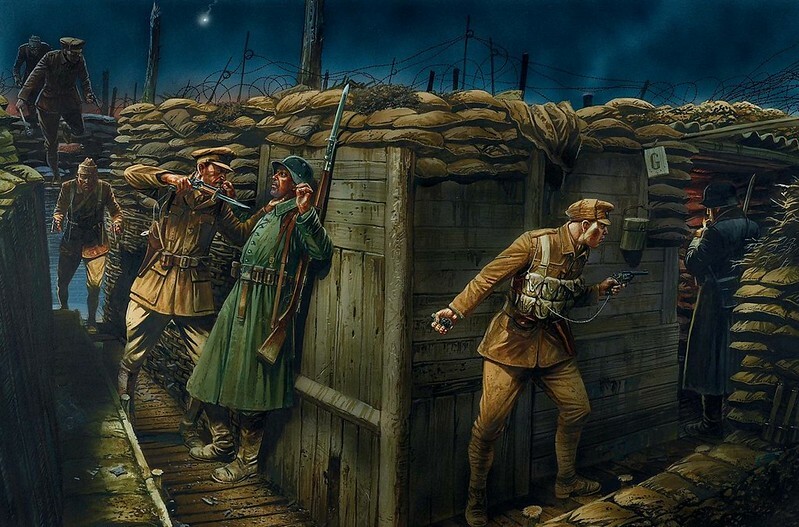 When testing the Luger the first time round I found a few issues with certain features. The barrel’s paint job wasn’t ideal, I just did a quick spray job to make it usable at the time. I could have re-done it with several coats and lacquer but decided instead that Oil finishing was the way to go. I cleaned the barrel, heated the piece and dropped it in the oil tank. (If you want to see how oil finishing works, you can check out this article here). 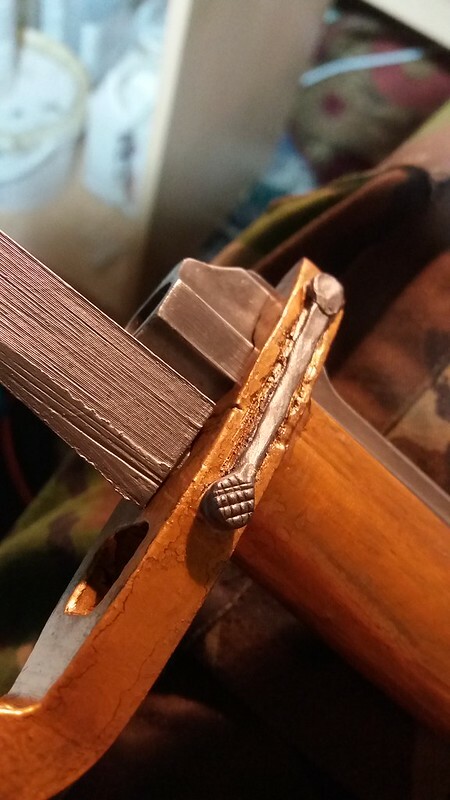 Also, the single screw holding the rear sight came loose under recoil after about half a day’s play so I added a second screw and loctite to keep it tight and in place. A second day’s testing and it’s ready to have the finishing touches added! Finished photographs to follow soon.